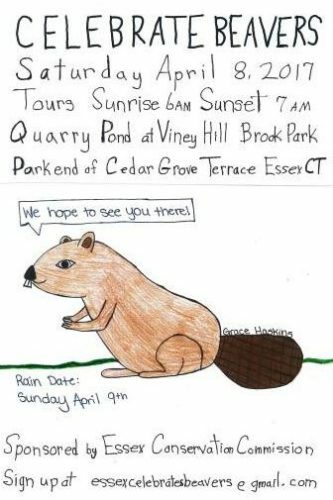 ESSEX — The Essex Conservation Commission is celebrating International Beaver Day on Saturday, April 8. Rain date is April 9. The Commission will be hosting tours of Quarry Pond at 6 a.m. (prior to sunrise) and 7 p.m. (prior to sunset). Beavers are nocturnal animals that tend to sleep during the day. The ability to see them is best at these times. Quarry Pond in located in the Viney Hill Brook Park in Essex, CT. Meet at the parking lot on the end of Cedar Grove Terrace prior to the start time of each tour. Beavers are known as a Keystone species. A keystone species is a plant or animal that plays a unique and crucial role in the way an ecosystem functions. Without keystone species, the ecosystem would be dramatically different or cease to exist altogether. All species in an ecosystem, or habitat, rely on each other. Come and visit to learn more about Beavers. Sign up by contacting EssexCelebratesBeavers@gmail.com.